My OSU Master Naturalists’ group eagerly followed Al Niem’s summons as we assembled for field studies. Our illustrious Professor of Geosciences was enthusiastically ready to reveal stories his trained eyes could see written in the rocks and landforms around us.Tectonic forces! Lithification! Lava flows! Landslides! Oh my! Here at our first stop, we were reminded that the main antagonist and protagonist in this series of dynamic earth geologic stories will be one and the same… the Cascadia Subduction Zone! This complex character has been long hard at work driving the plate tectonics of the Pacific Northwest. It’s a colossal role played from Vancouver Island, Canada to Cape Mendocino, California. The 620 mile subduction zone is one of the world’s largest. For the past 50 million years, the subduction of the Juan de Fuca oceanic plate beneath the North American continental plate has dramatically impacted the geologic history of this region. Here at Hug Point,where sedimentary and igneous rock formations are exposed that have been part of Oregon’s geologic history for the past 15 to 20 million years, Al began to read the rocks to us. The very dark gray/black rock to the right is basaltic lava deposited as a result of Miocene Columbia River Basalt flows. If the basalt was absent, I would imagine that Hug Point and much of the Oregon coast would look very different. It appears that the Miocene basalts protect great portions of the coastline from the erosion force of waves’ continual battering of the shore line. Left undisturbed, the sedimentary layers of rock would have remained below the earth’s surface all neat and tidy in horizontal stratum. But pressure from the Cascadia Subduction Zone caused layers of sandstone to tilt and dip into the earth. Al used a compass-like tool to measure the angles of the rocks he was reading for us. Some of the sedimentary beds tilted or were dipping into the earth 23 degrees to the north. Once sedimentary rocks are subjected to tectonic forces, they may be folded, tipped on edge, chopped up by faults, or even overturned. 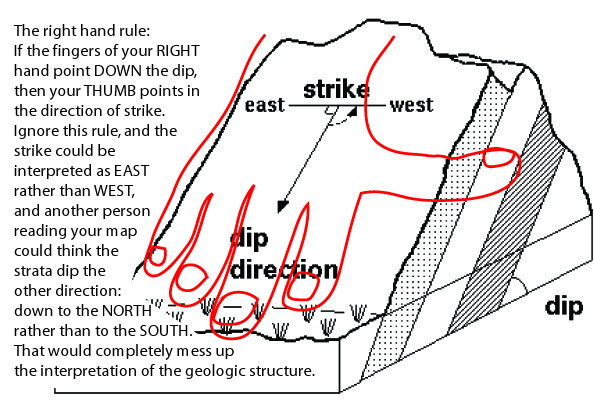 The orientation of the rock beds is described using ‘strike’ and ‘dip’. Dip refers to the downward angle at which the tilted beds now lie. A dip of 90 degrees is vertical. The dip might be stated as “beds dipping 45 degrees to the north”. Strike is more complicated. This is defined as the direction the contacts between the beds point when looking along the contact, and is always a compass direction exactly 90 degrees to the direction of dip. If the beds are folded, this direction will change over some distance. So, it is important that you are using the correct direction when describing the strike. Beds dipping to the north could conceivably be said to strike either to the east or the west. So a convention is necessary, since no direction is given on a map when the dip is recorded. We use the ‘right hand rule’ – when your fingers point down along the dip, your thumb points in the direction of strike. You have to orient your hand so your fingers point down the steepest angle of the tilted beds, the direction a drop of water would run down the rock. A hotspot at John Day twenty-million years ago caused the eruption of a super volcano and triggered the Columbia River Basalt flows. Al told of how the molten lava squeezed between the layers of pebbly sandstone and rapidly cooled. Intrusions into sedimentary layers occurred in several directions. Lava that seeped and cooled between layers vertically and cut across them are referred to as dikes. Lava that cooled between the layers horizontally and with the host sediment are called sills. Al laughed at the concept that some intrusions exhibit both behaviors… those are silly dikes. It’s fun to think that humor is written in the rocks, a timeless quality. Don’t you agree? Dikes and sills became more and more apparent to me as my eyes focused on seeing the stories told in the rocks. Geologists use cross-beds to decide what direction ancient river currents flowed. Cross-beds also provide an indication of how strong the current was. Al read the pebbled layers in this cross-bed and could see a time when the river flowed with more swiftness than it had at other times. I was awestruck when he concluded this story with the theory that we were standing in the ancient river-bed location of the Columbia River… No one in the group saw that one coming! Oh wow, I actually understood most of this! Great job! Thank you, Dandyknife. I’m happy top hear it made sense; when you visit the Oregon Coast, what you will see will also make a more sense! The geology is truly fascinating. Just got home from another weekend of class… This time we learned about sandy beaches and dune formation. I should have that segment up in a few days. This is fantastic, Jane! What a great blog post of our Oregon Master Naturalist Geology of the North Coast field trip and class! Thank you very much for sharing your acquired knowledge and wonderful photos from the day!